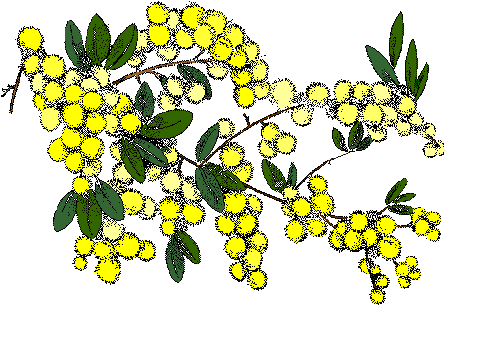 If you have Irish ancestry in Australia, there’s a good chance that at some point you’ve referred to an index of Irish Assisted Immigrants to New South Wales (NSW) 1848-1870, available in most family history libraries around Australia. I doubt I was alone in thinking, when I first used the index, that this was another very comprehensive genealogy-related index. 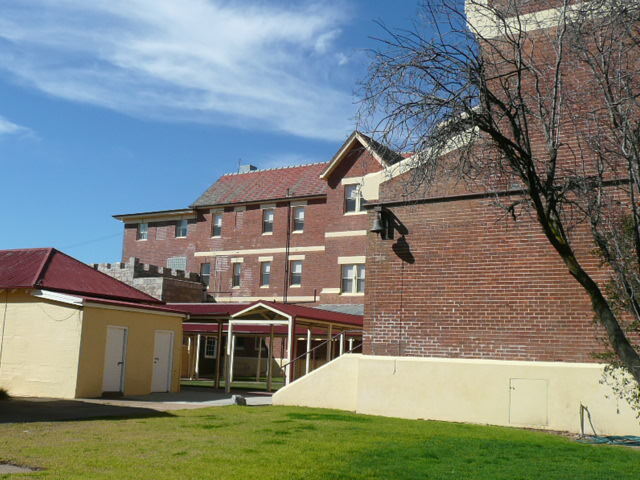 In fact, it was a by-product of Dr Richard Reid’s doctoral thesis, awarded in 1992 by the Australian National University, the topic of which was Aspects of Irish Assisted Emigration to New South Wales 1848-1870. This thesis can only be read on-site at ANU. What is exciting news for family historians with an Irish background is that in mid-2011 Richard released Farewell My Children – a book based largely on his thesis. I bought a copy at this year’s Shamrock in the Bush because I’d already read the thesis and I was desperately keen to have my own copy of this benchmark work. Read it, you won’t regret it! You might be thinking that if this started life as an academic publication it will be too “heavy” and too difficult to read. Not at all! The topics are clearly presented throughout and add greatly to our understanding of our ancestors’ emigration experiences. What I most like about Farewell My Children, and Richard’s historical writing in general, is that he illuminates the topic with specific examples. This personalises the history revealing the nuances at the grassroots level as well as the bigger picture. Another feature of Richard’s work is that he views Ireland as an entity not just Eire or Northern Ireland. While the focus is on Irish migration to Australia, it would also offer a comparative understanding to anyone whose Irish ancestors migrated to North America –after all they are quite likely to have distant family in Australia –it’s surprising how family sometimes took divergent migration paths. If you’ve found it difficult to get your head around the nuts and bolts of how your ancestors obtained their government assisted passage, and what evidence they had to supply, you will find it here. The practicalities of the Remittance Regulations[i] are also dealt with, including their occasional manipulation by representatives in Ireland and Australia. The complex and careful management of the immigrants is highlighted. It is pertinent to note the difference between the Australian journey and that of many migrant experiences to North America. It may have been a much longer journey, but the government was particularly attentive to its immigrants. A further benefit of this is the wonderful detail available in the bureaucratic records and especially the Board’s Immigrants Lists where they survive. 3. Who were the migrants? Do you ever wonder how typical your Irish family really was? Richard talks about the characteristics of the immigrants, their literacy and skills, age and gender balance as well as their marital status. This is a fascinating insight into the differences between Irish and other immigrants. The book and thesis train the research lens on the emigrants from Clonoulty. If you have ancestors from there, you will find this chapter especially useful. The book talks in detail about the Irish Famine Orphan migration from Ireland’s workhouses, which is relevant to our family as my husband’s ancestor was a Famine Orphan. It’s pertinent to note that not all were actually orphans. 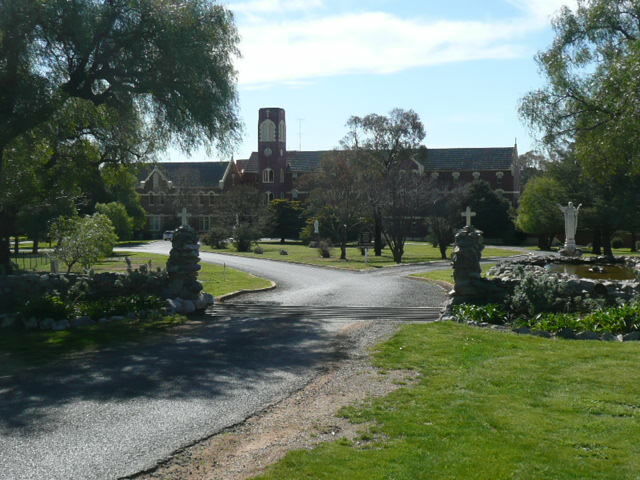 Wives and children of convicts also come under this heading as they were often impoverished by the breadwinner’s transportation. 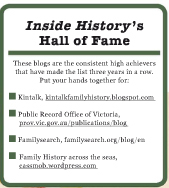 (Dr Perry McIntyre’s recent book Free passage : the reunion of Irish convicts and their families in Australia, 1788-1852 is also a must-read for anyone whose family fits this category). Remittances played a key role in the chains of Irish migration in families and friendship groups and are what led me to Richard’s thesis in 2004. 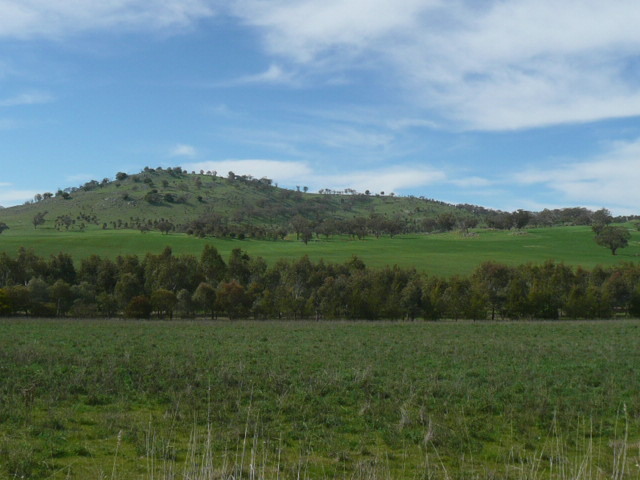 This was the link between this broader Irish research and my own East Clare research focused on Broadford, Parish of Kilseily where the parish priest and some key representatives in Australia appear to have manipulated the system to ensure a positive migration outcome for East Clare people. It’s no doubt obvious that I regard this book as the door to Dr Reid’s benchmark research on Irish migration to Australia. I for one am very grateful this research made the transition from academic thesis to an accessible book I can keep on my shelves. There are any number of reasons why Richard’s book is particularly relevant to my own research (especially East Clare migration) but I’m confident that anyone with Irish ancestry, or others, would be able to add to their understanding of the migration experience by reading it. Dr Reid’s history-writing style has made him one of my own “history heroes”. In my library his book sits beside Oceans of Consolation by David Fitzpatrick and Robin Haines’ Life and Death in the Age of Sail. With such significant and informative content Farewell my Children should become a prime resource for Irish family historians and anyone with an interest in Australian migration. If you’re looking for a Christmas gift for yourself, print out the book details and leave it lying around as a “hint” for the family gift-givers. Don’t forget, too, that if you live near a large reference library you can have the book sent on inter-library loan from the National Library of Australia. If you are interested in Irish migration you might also be interested in the small Visible Immigrants series which are collaborative publications: their content vastly outweighs their slight appearance. Disclosure: I have not been asked to comment on this book, nor did I receive any remuneration for promoting it. It stands entirely on its own merits. [i] The Index to the NSW Immigration Deposit Journals 1853-1900 produced by Pastkeys is a valuable entry-point to the remittances at a name level. 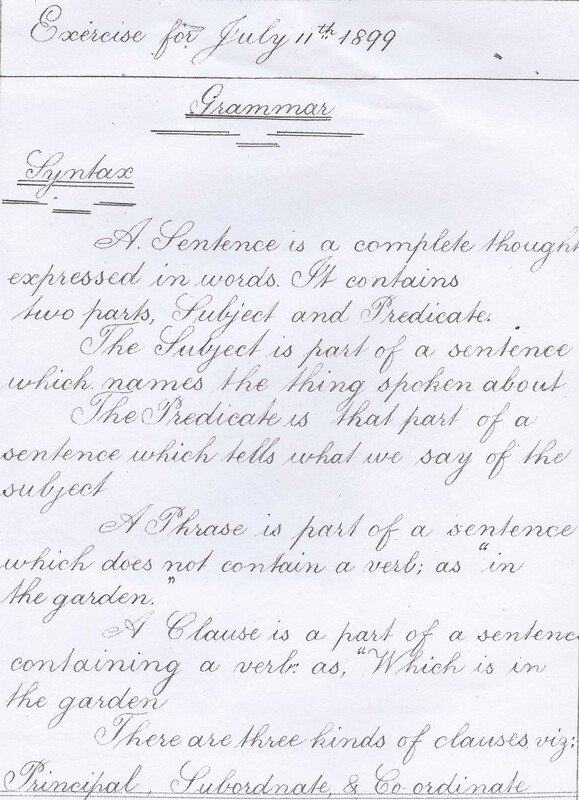 An extract from George Paterson's school exercise book from 1899, kindly donated to me by a relative. The vast panorama of the Not Just Ned exhibition has highlighted the importance of objects in telling the story of the Irish in Australia. No doubt a similar canvas could be presented for other ethnic groups. Without the objects we’d have had an un-engaging array of documents and images. Some objects illustrated a particular aspect of life (perhaps the work of the immigrants on the Rajah quilt), some illuminated a formerly unknown-to-me event (the breastplate given to the Aborigines who humanely assisted Burke & Wills) and other items serve to remind us of our own experiences (for me, the Child of Mary cloak, Archbishop Duhig and the Hibernian sashes). So what does this mean for our family history practice? Do we adequately consider how things or objects can not only illustrate our family’s story but also add to it, and possibly to a wider social history? A number of blogs clearly show the importance of objects and can profoundly tell us about a particular family’s history as set within a broader context eg the World War II diary of a woman in London tells us about her own family and marital issues, as well as the broader social circumstanc of living with wartime hazards and restrictions, and over on A Hundred Years Ago, young Helena Muffy’s diary is woven with background research into social history of the time. Charles Fleming’s diary of the voyage of the Eastern Monarch in 1883 not only tells the story of the voyage and its relevance to his family, but is directly relevant to the family history of all the other immigrants on that ship. These diaries are certainly valuable objects in highlighting both family and social history of ordinary people. On the Tree of Me Sharon has shared her family treasures of electors’ rights certificates, illustrating an document, but also an object, that many men would have had at one time. 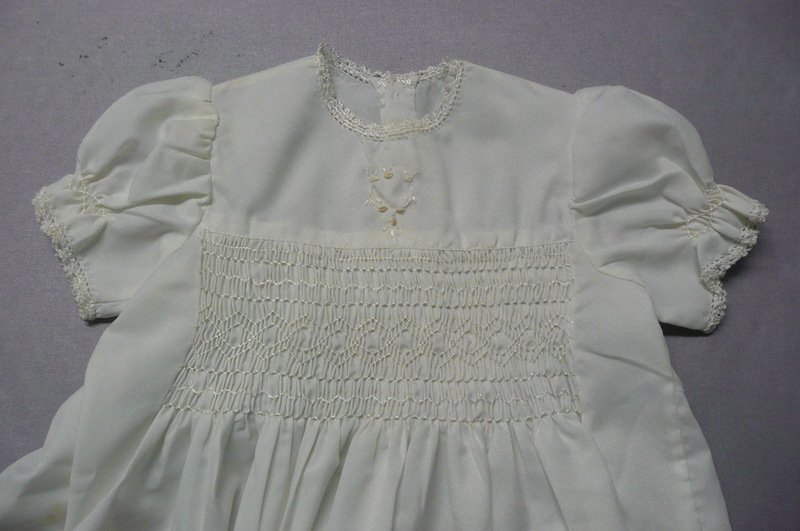 Smocking and embroidery on a christening robe for a grandchild. It seems to me that objects are perhaps more telling in the lives of women and children whose history often goes undocumented in official records such as the documents we so carefully pursue and trawl. Recipe books, craft, handiwork or special items can illustrate a woman’s life and her work to make our family history richer and more interesting. School exercise books can tell the story not only of an individual but also of changing educational practices. (My Kunkel family history included an example of one such as did the Not Just Ned exhibition). Having recently been packing and unpacking our house for painting, I’ve been bemoaning the volume of “stuff” that I seem to have despite multiple efforts at rationalising, weeding out, or trips to Anglicare or Vinnnies. This topic is a salutary reminder that not all our belongings should be categorised as unnecessary stuff or old junk: we throw them out at our family’s peril. 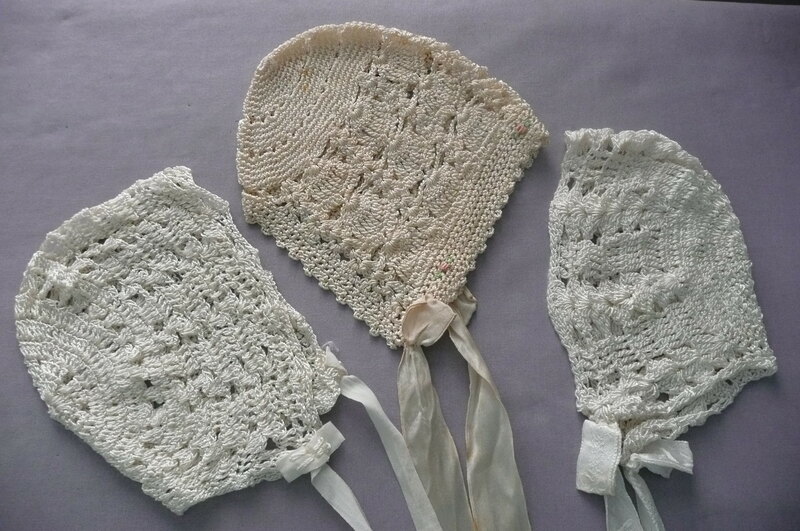 If each generation kept at least a small handful of special objects just imagine how much richer and how precious our family history collections could be. I suspect much has been lost in the earlier days before family history and the recording of ordinary lives gained such prominence.Every time I replay in my mind a conversation with a grandchild of my original Australian couple, George and Mary Kunkel, I could cry as she told of photos that people would laugh at, and other things being burnt! Did this include family portraits from overseas? Naturalisation certificate for my Bavarian-born great-great-grandfather and her grandfather? Letters to or from Ireland or Germany? Truly irreplaceable items for my family history. 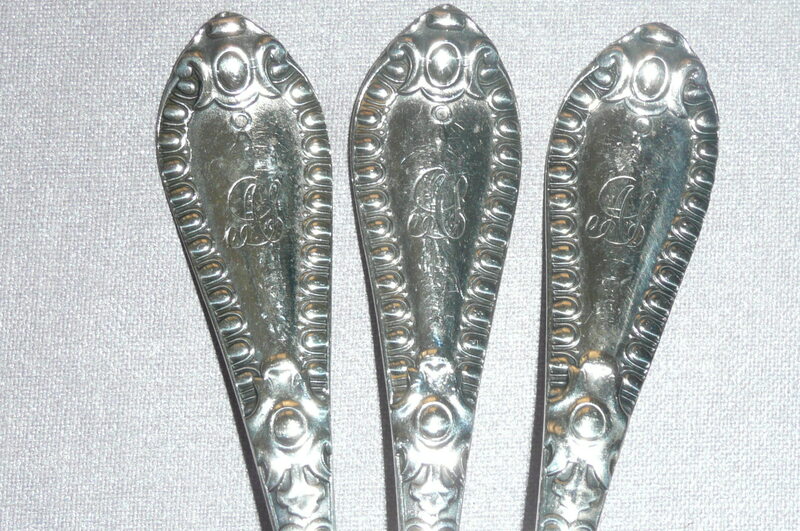 Spoons embossed with my great-grandmother’s initials; passed down to her daughter and then to me, and will ulitmately go to my daughters and granddaughter. How can we stop the same thing happening to the objects which tell our story? How do we convince our descendants that these objects tell their life story as well as ours, or those of earlier ancestors: tangible reminders of lives past? I have photographed important items and plan to write up the short story of each and why it’s important but it’s also critical to ensure we leave these objects in the care of someone who will truly value them. So often they have little financial value but immense personal worth. What do other people think? What are your strategies? I’d love to hear. [i] Richard Reid, “An Impossible Subject, preparing an exhibition on the Irish in Australia” in Irish and the Irish Antipodes: One World or Worlds Apart, Australasian Irish Studies Conference Papers, July 2009. Shamrock in the Bush 2011: a grand event to be sure! Shamrock in the Bush 2011 has once again come and gone. This was the 19th Shamrock but while I have only been to three, the entire weekend has been as exciting and stimulating as in other years. One of the things I like most about Shamrock is the atmosphere of collegiality among all the participants and speakers. As a residential weekend we spend so much time together and learn about each other’s interests and very quickly strangers become friends. The other highlight of the weekend is always the diversity of the topics. I’ve learned that even when the topic doesn’t have any direct relevance or interest to you, the enthusiasm and knowledge of the speakers quickly engages you and stimulates your interest. I think this year’s Keynote Speaker, Claire Dunne, would almost certainly be on everyone’s list of favourite presentations. For about an hour she held the whole room in thrall, fully engaged with her story. And what a story it was! She has led an amazing life which is only superficially covered in a recitation of her curriculum vitae. Every listener will have taken away their own special points from it with perhaps the sheer emotion of the emigrant’s sense of loss of home and place being perhaps the common point we’d all list. Claire’s emotive and emotional telling of her return to Ireland and engagement with the land had a very indigenous overtone which was incredibly powerful. Not surprising then, that she had experienced such identification with Australia’s own Indigenous people. Coming from the Northern Territory I found that aspect of her talk very fascinating. Her own unplanned, evolutionary path through life, shows the power of the mysterious and requires responding to spirit…as well as a surfeit of courage. She talked of the need for spiritual sustenance for her life which she found in her return visits to Ireland where she drew from engagement with the land. These periods represented to me a form of spiritual “retreat” though she nevertheless connected with many people during these times. What they did was feed her spirit and give her strength. Without them she said she would be like a tree whose leaves and branches look in fine condition but whose roots are slowly dying. Very powerful stuff! Her path was also sometimes revolutionary, as with establishing ethnic radio broadcasting. She told the emotional story of a Turkish man driving down Parramatta Road in Sydney in 1965 who suddenly stopped in the middle of the traffic, got out and started to dance. ‘That’s my language, that’s my music,’ he shouted. The overall theme of the conference presentations linked to the Not Just Ned exhibition and provided a background depth to the objects and images on display. The skill and commitment shown by the conservators who worked behind the scenes to present the objects in optimal condition became very clear from the talk given by David Hallam who focused on the story behind getting the anchor from the Nashwauk, shipwrecked with Irish female immigrants on board, and the Kelly armour exhibition-ready. David’s talk was absolutely riveting including the complex science involved in confirming the armour was consistent with being made from plough-shares, and rough-made over a bush fire and not prepared by an expert blacksmith over a forge. The bullet mark in the centre of one of the suits was not, as might be thought, from the siege at Glenrowan but a 20th century addition! The restoration of the Nashwauk’s anchor after 160 years of depredation by salt water and salt air was equally impressive. 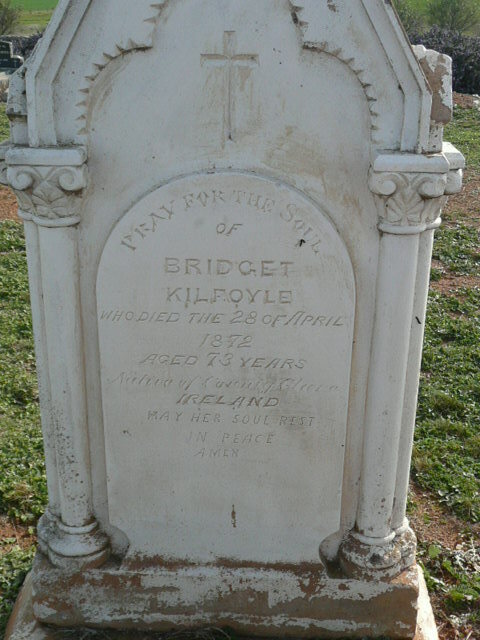 Bridget Kilfoyle's gravestone in the Galong cemetery. This Clare emigrant's husband was related closely to the Duracks. Perry McIntyre’s talk on the early male students at St John’s College, University of Sydney left me brainstorming potential research strategies. Perry’s book Free Passage: The Reunion of Irish Convicts and Their Families in Australia, 1788-1852 was also available for sale & I’m looking forward to an in-depth reading of it. 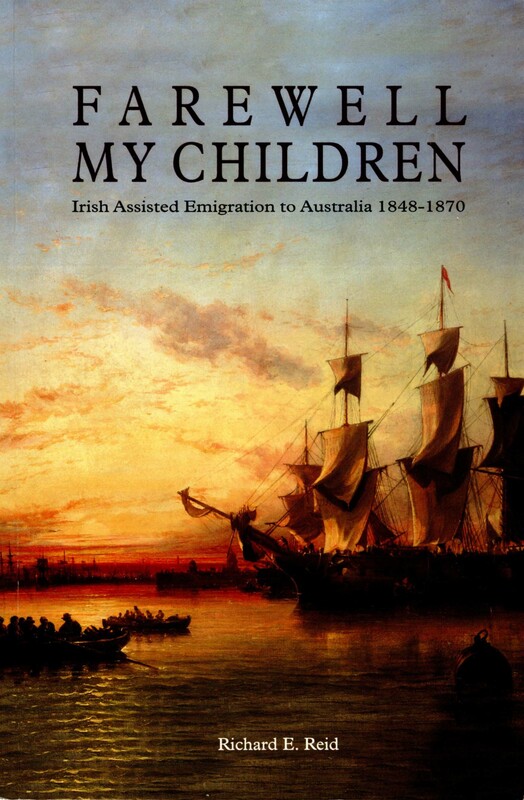 Dr Richard Reid’s book Farewell my Children: Irish Assisted Emigration to Australia 1848-1870 was also available. This book is heavily based on Richard’s thesis and will provide wonderful background for anyone with Irish ancestors. I have a particular interest in it because of my research with East Clare immigrants/emigrants but there’s also a wonderful chapter on the Donegal Relief Fund and those immigrants. If buying a copy for your personal library is not possible, then you can always request it on inter-library loan from the (NLA) National Library of Australia (assuming you’re in Oz). Two other talks I especially enjoyed were those by the National Library’s Oral History staff. Rob Willis spoke about childhood taunts of Catholic vs Protestant pre-1970 which brought back a number of personal memories. The Unit’s Curator, Kevin Bradley, highlighted the value of the NLA’s oral history collection with a sample of Irish music recordings as well as interviews with a range of Irish Australians. Some of their collection is online now so it’s well worth a look. 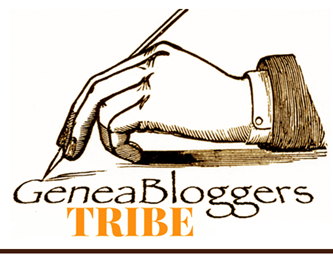 A few years ago I found bush poetry, bush ballads and political satire by Tom and Michael Widdup, descendants of my great- great-grandmother’s sister. 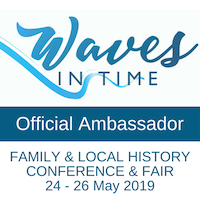 The highlight of Kevin’s talk was listening to Mary Durack talking of her father’s emotional reaction to seeing emigrants leaving from Sligo and farewelled by family and friends. It was clear to Mary Durack that her father’s reaction came from the brief time-distance of 46 years which separated the Durack family’s departure from Ireland and these strangers’ emigration from Sligo. The Duracks came from the far north-east of Clare they are part of my East Clare database and of particular interest to me for this reason. This view of St Clements shows a little of Ned Ryan's turreted castle. A feature I particularly enjoy about Shamrock is that each talk is introduced by a poem, reading or song, often by Shamrock minstrel John Dengate. It adds a richness to this event that’s just not found with other conferences. On top of the talks we also had a trip to Canberra to visit the Not Just Ned exhibition and the Irish Embassy….how much fun was all that! Combine all this with a wonderful Shamrock Christmas-in-July dinner in Ned Ryan’s little slice of Tipperary (Galong House), throw in great camaraderie and enthusiastic conference attendees and it was a recipe for another superb weekend. Thanks to the organisers, speakers, and the volunteers who provide us all with such a great time. But don’t let these sunny photos from an earlier Shamrock fool you….Sunday at Galong this year was FREEZING especially for a Top Ender. Attendance at Shamrock in the Bush at Galong is a highly competitive affair. Irish family historians descend on St Clement’s Retreat and Conference House, the old homestead of former-convict-made-good, Ned Ryan, for three days of talks, music, historical delights and good old Irish craic or fun. Shamrock 2011 has been eagerly awaited by former attendees as co-organiser of Shamrock, Richard Reid, is also curator of the Not Just Ned exhibition at the National Museum and has been regaling us with the delights ahead for the past conference or two. Do read his excellent essay on the Irish in Australia on the Australian National Museum website. Irish family historians will know Richard from his index of Irish immigrants to Australia…he has a wealth of knowledge about his topic. The Shamrock in the Bush conference has an amazing ambience – perhaps it’s the location with Ned Ryan’s historic hospitality in the air, or perhaps it’s being away from the city with freedom from modern communications (mobiles and hence internet don’t work) but the delegates all seem to have a great time, many coming year after year. There is such an air of camaraderie and enthusiasm among the crowd with varying levels of knowledge and expertise being shared among the crowd. I enjoyed it so much in 2009 that it has become part of my annual travel planning despite the 4000km trek from Darwin. The speakers are knowledgeable and passionate about their topics which is infectious. You might think “oh that topic doesn’t interest me” but then you listen to it and are fully engaged. Most talks are introduced with music and poetry from minstrel John Dengate which adds an extra delight. On top of which this year we have a trip to the Ned exhibition and to the Irish Embassy! How much fun will all that be?! Richard’s most able co-organiser, Cheryl Mangan, does a fabulous job of getting everything in place and running efficiently both before and during the event. Without her and her dedicated workers, volunteers and helpers, the event would not be the great success it surely is. If you have Irish ancestry, do yourself a favour and check out the site. I believe there are still some vacancies left for this year’s conference. And if you can’t be there this year, put it on your agenda for 2012 –it’s usually the first weekend in August.